Segurança Products/n.e.s.,Segurança marinha Equipments/n.e.s.,Segurança & Protection/n.e.s. Features: . The anti-slip tape is coated with aluminum oxide and silicone carbide (tough mineral) as waterproof non-skid surface backing with pressure sensitive adhesive paper (tear type). . 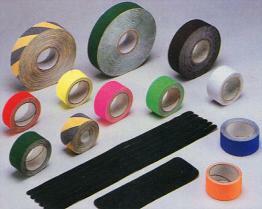 The anti-slip tape is a high quality abrasive tape that can reduce injury caused by accidental slips and falls. The durable grit resists oil and water. It could be applied to both indoor and outdoor places to prevent from slipping, such as skateboard, steps, walkways, hospitals, public balcony, work areas, industrial equipment, trucks, also ideal as decorative item, it?s easy to apply. . The anti-slip tape has rectangular sizes with round and square corners. It could also be provided in rolls or cut by your required sizes. There?re lots of colours available and we can also match colours by your request. Vibrant colours and hazard stripes are highly visible to increase hazard awareness. Segurança & proteção, Segurança Products/n.e.s., Segurança Products/n.e.s. , Esportes & entretenimento, Equipamentos de segurança marinha, Segurança marinha Equipments/n.e.s. , Segurança & proteção, Segurança & Protection/n.e.s., Segurança & Protection/n.e.s.